﻿ UK's largest selection of shutter ranges… | The Great Shutter Co. The Great Shutter Co. has the widest choice of plantation shutter ranges in the UK from MDF to white teak shutters as well as basswood and vinyl bathroom shutters. We bring the showroom to you so that you can see and feel the product, choose from the full range of colours offered and visualise how the louvre size chosen will affect the control you have over privacy and light. The Basingstoke Shutter Range is manufactured here in the UK and is ideal if you would like to have shutters installed in a hurry. With a three week lead time and a 25 year guarantee these vinyl (poly vinyl) shutters are robust and are also 100% waterproof. They come in a choice the UK's two most popular whites and a cream. Should you be looking for faux wood shutters please click here. The Alresford Shutter Range is a 100% waterproof range manufactured from ABS plastic. The beauty of ABS is that it is so easily moulded which ensures that you can replicate the refinement that you see in wooden frames allowing you to maintain the aesthetics of a wooden shutter. The Andover Shutter Range is hardwood shutter suited for those with regular shaped window openings and looking for a painted finish. This basswood plantation shutter is available in a choice of contemporary colours and also comes with a hidden tilt rod at no extra cost. The Alton Shutter Range is a composite range that is available in a selection of 28 contemporary colours. 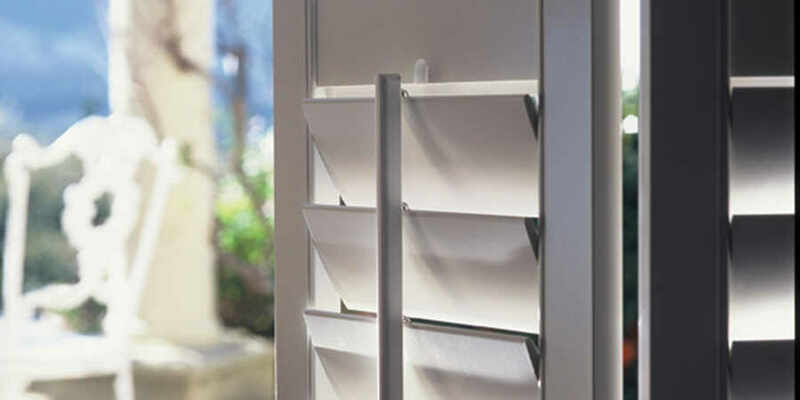 Manufactured from MDF with lightweight ABS louvres it is hard to differentiate this range from a painted wooden shutter. The Petersfield Shutter Range is an all hardwood shutter panel which is hinged to an MDF frame. This design allows cost savings to be made while still ensuring that a lightweight, all wood shutter is still being used to dress the recess. The Hampshire Shutter Range is manufactured from MDF. This is an amazingly robust range due to the pre- coloured extruded polymer coating used in manufacture but it does have certain limitations due its weight and the fact that unlike wood it cannot be carved. It is though a quality product and comes with our standard 3 year guarantee. For more information on the range scroll to the bottom of the page. The Express Shutter Range - Fitted in 3 Weeks. These shutters are available in 2 different materials - MDF or faux wood. We can fit the faux wood within 3 weeks of order and the MDF within 4 weeks. Normal lead time for shutters are 9-10 weeks.